- Fiduciary duties and shareholder control. 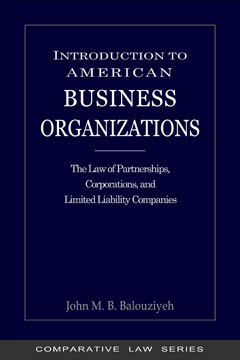 This book is designed to provide a succinct overview of the case law and statutes governing American business associations. The chapters cover a wide range of topics, taking the reader through a step-by-step exposition of a variety of organizations, from the basic sole proprietorships to the most complex multi-tiered corporate conglomerates. 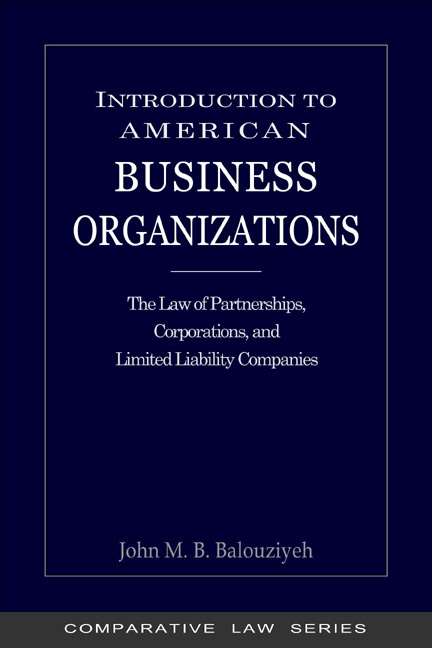 By examining the laws governing corporations, partnerships, and statutory companies, this study will explore how business organizations are formed, controlled, taxed, and dissolved. It will further examine issues of liability, property, and governance that are unique to each business model, as well as the characteristics that are unique to corporations-both public and closely held-and partnerships-both general and limited-under United States federal and state law. The present volume is intended for students of American law as well as entrepreneurs and business leaders who wish to become more informed about the laws governing American business associations. It would also be useful for scholars of comparative law who desire to learn more about the American legal system. 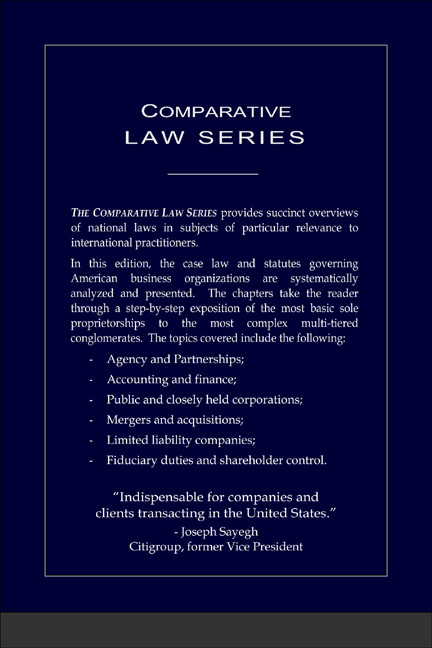 The volume will familiarize the reader with the principal legal precepts and vocabulary relating to the functioning and governance of corporations, partnerships, and other business entities in the United States. This study will also prove valuable to foreign attorneys practicing international private law. In our increasingly globalized world, given the sheer volume of American corporations involved in international contracts, mergers, and acquisitions, practitioners of international law are likely to come across choice of law clauses selecting the American law as governing a particular transaction. As a result, the American law has influenced the rules of international commerce and it is not unusual to find legal concepts deriving from American case law or statutes imported into foreign contracts or even jurisprudence. Attorneys who stand ready to tackle lawyering across multiple legal jurisdictions will inevitably benefit from an understanding of basic American legal principles, especially if their clients are engaged in international operations. This volume will provide such attorneys with the foundation necessary to understand the American law, while offering them numerous references to cases and statutes for further study. A.P. Smith Mfg. Co. v. Barlow, 98 A.2d 581 (N.J. 1953); Alaska Plastics, Inc. v. Coppock, 621 P.2d 270 (Alaska 1980); Arguello v. Conoco, Inc., 207 F.3d 803 (5th Cir. 2000); Atlantic Salmon A/S v. Curran, 591 N.E.2d 206 (Mass. App. Ct. 1992); Auerbach v. Bennett, 393 N.E.2d 994 (N.Y. 1979); Austin v. Consolidated Edison Company of New York, Inc., 788 F.Supp. 192 (S.D.N.Y. 1992); Bane v. Ferguson, 890 F.2d 11 (7th Cir. 1989); Basic Inc. v. Levinson, 485 U.S. 224 (1988); Bayer v. Beran, 49 N.Y.S.2d 2 (N.Y. 1944); Botticello v. Stefanovicz, 411 A.2d 16 (Conn. 1979); Brehm v. Eisner, 746 A.2d 244 (Del. 2000); Broz. v. Cellular Information Systems, Inc., 673 A.2d 1148 (Del. 1996); Caremark International Inc. Derivative Litigation, In re, 698 A.2d 959 (Del. Ch. 1996); Citadel Holding Corp. v. Roven, 602 A.2d 818 (Del.1992); Clark v. Dodge, 199 N.E. 641 (N.Y. 1936); Coggins v. New England Patriots Football Club, Inc., 492 N.E.2d 1112 (Mass. 1986); Cohen v. Beneficial Industrial Loan Corp., 337 U.S. 541 (1949); Collins v. Lewis, 283 S.W.2d 258 (Tex. Civ. App. 1955); Crane Co. v. Anaconda Co., 346 N.E.2d 507 (N.Y. 1976); Day v. Didley & Austin, 394 F. Supp. 986 (D.D.C. 1975); Deutschman v. Beneficial Corp., 841 F.2d 502 (3rd Cir. 1988); Dirks v. Securities & Exchange Commission, 463 U.S. 646 (1983); Dodge v. Ford Motor Co., 170 N.W. 668 (Mich. 1919); Doran v. Petroleum Management Corp., 545 F.2d 893 (5th Cir. 1977); EBay, Inc. Shareholders Litigation, In re, 2004 WL 253521 (Del.Ch. 2004); Eisenberg v. Flying Tiger Line, Inc., 451 F.2d 267 (2d Cir. 1971); Elf Atochem North America, Inc. v. Jaffari, 727 A.2d 286 (Del. 1999); Escott v. BarChris Construction Corp., 283 F. Supp. 643 (S.D.N.Y. 1968); Essex Universal Corporation v. Yates, 305 F.2d 572 (2d Cir. 1962); Farris v. Glen Alden Corporation, 143 A.2d 25 (Pa. 1958); Fenwick v. Unemployment Compensation Commission, 44 A.2d 172 (N.J. 1945); Fliegler v. Lawrence, 361 A.2d 218 (Del.1976); Francis v. United Jersey Bank, 432 A.2d 814 (N.J. 1981); Frandsen v. Jensen-Sundquist Agency, Inc., 802 F.2d 941 (7th Cir. 1986); Frigidaire Sales Corporation v. Union Properties, Inc., 562 P.2d 244 (Wash. 1977); G&S Investments v. Belman, 700 P.2d 1358 (Ariz. Ct. App.1984); Galler v. Isadore Galler, 203 N.E.2d 577 (Ill. 1964); Gay Jenson Farms Co. v. Cargill, Inc., 309 N.W.2d 285 (Minn. 1981); General Automotive Manufacturing Co. v. Singer, 120 N.W.2d 659 (Wis. 1963); Goodwin v. Agassiz, 186 N.E. 659 (Mass. 1933); Gorton v. Doty, 69 P.2d 136 (Idaho Ct. App. 1937); Gottlieb v. Hayden, 91 A.2d 57 (Del. 1952); Grimes v. Donald, 673 A.2d 1207 (Del. 1996); Haley v. Talcott, 864 A.2d 86 (Del. Ch. 2004); Hall v. Geiger-Jones Co., 242 U.S. 539 (1917); Hariton v. Arco Electronics, Inc., A.2d 123 (Del. 1963); Hoddeson v. Koos Bros., 135 A.2d 702 (N.J. Super. App. Div. 1957); Holzman v. De Escamilla, 86 Cal.App.2d 858 (Cal. Ct. App. 1948); Hoover v. Sun Oil Co., 212 A.2d 414 (Del. 1965); Humble Oil & Refining Co. v. Martin, 222 S.W.2d 995 (Tex. 1949); Ingle v. Glamore Motor Sales, Inc., 535 N.E.2d 1311 (N.Y. 1989); Ira S. Bushey & Sons, Inc. v. United States, 398 F.2d 167 (2d Cir. 1968); J.I. Case Co. v. Borak, 377 U.S. 426 (1964); Jewel v. Boxer, 156 Cal.App.3d 171 (Cal. Ct. App. 1984); Jordan v. Duff and Phelps, Inc., 815 F.2d 429 (7th Cir. 1987); Kamin v. American Express Co., 85 Misc.2d 809 (N.Y. 1976); Kaycee Land and Livestock v. Flahive, 46 P.3d 323 (Wyo. 2002); Kid v. Thomas A. Edison, Inc., 239 Fed. 405 (S.D.N.Y. 1917); Kovacik v. Reed, 49 Cal.2d 166 (Cal. 1957); Lawlis v. Kightlinger & Gray, 562 N.E.2d 435 (Ind. Ct. App. 1990); Levin v. Metro-Goldwyn-Mayer, Inc., 264 F. Sup. 797 (S.D.N.Y. 1967); Lewis v. S.L. & E., 629 F.2d 764 (2d Cir. 1980); Lind v. Schenley Industries, Inc., 278 F.2d 79 (3d Cir. 1960); Lovenheim v. Iroquois Brands, 618 F.Supp. 554 (D.D.C. 1985); Lovenheim v. Iroquois Brands, Ltd., 618 F. Supp. 554 (D.D.C. 1985); Majestic Realty Associates, Inc. v. Toti Contracting Co., 153 A.2d 321 (N.J. 1959); Manning v. Grimsley, 643 F.2d 20 (1st Cir.1981); Martin v. Peyton, 158 N.E. 77 (N.Y. 1927); Marx v. Akers, 666 N.E.2d 1034 (N.Y. 1996); McConnell v. Hunt Sports Enterprises, 725 N.E.2d 1193 (Ohio Ct. App. 1999); McQuade v. Stoneham, 189 N.E. 234 (N.Y. 1934); Meehan v. Shaughnessy, 535 N.E.2d 1255 (Mass. 1989); Meinhard v. Salmon, 164 N.E. 545 (N.Y. 1928); Mill Street Church of Christ v. Sam Hogan, 785 S.W.2d 263 (Ky. Ct. App. ); Miller v. McDonald's Corp., 945 P.2d 1107 (Or. App. 1997); Mills v. Electric Auto-Lite Co., 396 U.S. 375 (1970); Moren ex rel. Moren v. JAX Restaurant, 679 N.W.2d 165 (Minn. Ct. App. 2004); Murphy v. Holiday Inns, Inc., 219 S.E.2d 874 (Va. 1975); National Biscuit Co. v. Stroud, 106 S.E. 2d 692 (N.C. 1959); New Horizons Supply Cooperative v. Haack, 590 N.W.2d 282 (Wis. Ct. App. 1999); New York City Employees' Retirement System v. Dole Food Company, Inc., 795 F. Supp. (S.D.N.Y. 1992); Nogales Service Center v. Atlantic Richfield Co., 613 P.2d 293 (Ariz. 1980); Oracle Corp. Derivative Litigation, In re, 824 A.2d 917 (Del. Ch. 2003); Owen v. Cohen, 19 Cal.2d 147 (Cal. 1941); Page v. Page, 55 Cal.2d 192 (1961); Pav-Saver Corp. v. Vasso Corp, Ill. App.3d 1013 (Ill. App. Ct. 1986); Pedro v. Pedro, 489 N.W.2d 798 (Minn. Ct. App. 1992); Prentiss v. Sheffel, 513 P.2d 949 (Ariz. Ct. App. 1973); Putnam v. Shoaf, 620 S.W.2d 510 (Tenn. Ct. App. 1981); Rabkin v. Philip A. Hunt Chemical Corporation, 498 A.2d 1099 (Del.1985); Ramos v. Estrada, 8 Cal.App.4th 1070 (Cal. Ct. App. 1992); Rauch v. RCA Corporation, 861 F.2d 29 (2d Cir. 1988); Reading v. Regem, 2 All ER 27 (King's Bench 1948); Ringling Bros.- Barnum & Bailey Combined Shows v. Ringling, 53 A.2d 441 (Del. Ch. 1947); Robinson v. Glynn, 349 F.3d 166 (4th Cir. 2003); Roman Catholic Archbiship of San Francisco v. Sheffield, 15 Cal. App. 3d 405 (Cal. Ct. App. 1971); Rosenfeld v. Fairchild Engine & Airplane Corp., 128 N.E.2d 291 (N.Y. 1955); Sadler v. NCR Corporation, 928 F.2d 48 (2d Cir. 1991); Santa Fe Industries, Inc. v. Green, 430 U.S. 462 (1977); Sea-Land Services, Inc. v. Pepper Source, 941 F.2d 519 (7th Cir. 1991); Securities & Exchange Commission v. Texas Gulf Sulphur Co., 401 F.2d 833 (2d Cir. 1968); Seinfeld v. Bartz, 2002 WL 243 243597 (N.D.Cal. 2002); Shlensky v. Wrigley, 237 N.E. 2d 776 (Ill. App. Ct. 1968); Silicone Gel Breast Implants Products Liability Litigation, In re, 887 F.Supp. 1447 (N.D. Ala. 1995); Sinclair Oil Corp. v. Levien, 280 A.2d 717 (Del. 1971); Smith v. Atlantic Properties, Inc., 422 N.E.2d 798 (Mass. App. Ct. 1981); Smith v. Van Gorkom, 488 A.2d 858 (Del. 1985); Southern-Gulf Marine Co. No. 9, Inc. v. Camcraft, Inc., 410 So.2d 1181 (La. Ct. App. 1982); Southex Exhibitions, Inc. v. Rhode Island Builders Association, Inc., 279 F.3d 94 (1st Cir. 2002); State Ex Rel. Pillsbury v. Honeywell, Inc., 191 N.W. 2d 406 (Minn. 1971); State of Wisconsin Investment Board v. Peerless Systems Corp., 2000 WL 1805376 (Del. Ch. 2000); Stroh v. Blackhawk Holding Corp., 272 N.E.2d 1 (Ill. 1971); Stuparich v. Harbor Furniture Mfg. Inc., 83 Cal. App. 4th 1268 (Cal. Ct. App. 2000); Sugarman v. Sugarman, 797 F.2d 3 (1st Cir. 1986); Summers v. Dooley, 481 P.2d 318 (Idaho 1971); Three-Seventy Leasing Corporation v. Amex Corporation, 528 F.2d 993 (5th Cir. 1976); Town & Country House & Home Service, Inc. v. Newbery, 147 N.E.2d 724 (N.Y. 1958); United States v. O'Hagan, 521 U.S. 642 (1997); Walkovsky v. Carlton, 223 N.E.2d 6 (N.Y. 1966); Waltuch v. Conticommodity Services. Inc., 88 F.3d 87 (2d Cir. 1996); Water, Waste & Land, Inc. D/B/A Westec v. Lanham, 955 P.2d 997 (Col. 1998); Watteau v. Fenwick, 1 Queen's Bench 346 (1892); Weinberger v. UOP, Inc., 457 A.2d 701 (Del. 1983); Wheelabrator Technologies, Inc., In re, 663 A.2d 1194 (Del. Ch. 1995); Wilkes v. Springside Nursing Home, Inc., 353 N.E.2d 657 (Mass. 1976); Young v. Jones, 816 F.Supp. 1070 (D.S.C. 1992); Zahn v. Transamerica Corporation, 162 F.2d 36 (3d Cir. 1947); Zapata Corp. v. Maldonado, 430 A.2d 779 (Del. 1981); Zetlin v. Hanson Holdings, Inc., 397 N.E.2d 387 (N.Y. 1979).